The 2014 Prix Aurora-Boréal shortlist was released April 11 by Congress Boréal on Facebook. The award recognizes the best French language sf and fantasy works published in Canada. SFSF Boréal Inc. and the Canadian Association of Science Fiction and Fantasy are the award’s sponsors. Winners are selected by a vote of readers and will be announced May 4 in Quebec. Former editor of Mad Magazine Al Feldstein died April 29 at his home in Montana. He was 88. I long ago forgave him for rejecting the parody of Star Trek I drew in the ninth grade with a ballpoint pen on lined notebook paper, and sent with a return envelope too small for the manuscript because it was – of course! – going to sell. The only rule of professional writing I didn’t break at the time was to submit to a publication I hadn’t read. I knew it very well: I loved Mad. Feldstein was hired by EC (“Educational Comics”) as an artist in 1948. 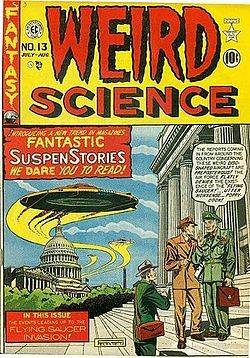 In the mid-1950s he edited EC’s New Trend group, known for such titles as Weird Science, Weird Fantasy, and Tales from the Crypt. The Wertham-inspired crackdown on comics forced EC to kill many of its titles and put Feldstein out of work. However, when Mad’s founding editor Harvey Kurtzman departed in 1956, Feldstein took his place and spent the next three decades satirizing America from Madison Avenue to Hollywood. Feldstein’s aptitude for art was evident when he won an award in the 1939 New York World’s Fair poster contest. He trained at Manhattan’s High School of Music and Art and Brooklyn College. When he was 15 he went to work in the Eisner & Iger shop, an art service for comic book publishers, making $3 a week inking balloon lines and erasing pages. His career at Mad ended in 1984 as its fading popularity led to a precipitous drop in circulation. He moved to Wyoming, and later, Montana. He resumed his early interest in oil painting, depicting wildlife, nature scenes and fantasy art. Several of his works placed in the Top 100 of Arts for the Parks, a competition created in 1986 by the National Park Academy of the Arts. In 2000, he received an honorary doctorate in fine arts from Rocky Mountain College. Feldstein’s survivors include his wife, Michelle, stepdaughter Katrina Oppelt, her husband, and two grandsons. Baen Books, in association with gaming convention Gen Con, has launched the Baen Fantasy Adventure Award. The award will go to the adventure fantasy short story selected as the winner of its new annual contest. The contest opens for submissions on May 1, 2014 and all entries must be received June 30, 2014. Each entry is limited to a short story of no more than 8,000 words, and there is one entry per author. The story may be epic fantasy, heroic fantasy, sword and sorcery, or contemporary fantasy. Judging will be by the Baen editorial staff, with final entries also being judged by Larry Correia. The Grand Prize winner will be published as the featured story on the Baen Books main website and paid at industry-standard rates for professional story submittals. The author will also receive an engraved award and a prize package containing various Baen Books. Second and Third Place winners will receive a prize package of Baen Books. The winners will be honored as part of the 2014 Gen Con’s Writer’s Symposium. Gen Con takes place August 14-17. Baen’s new award, therefore, will be presented the same weekend as the Hugos. British actor, screenwriter and director Bob Hoskins died April 29 at the age of 71. He had been suffering from Parkinson’s Disease and was receiving hospital treatment for pneumonia. Hoskins became a household name after taking the lead in Dennis Potter’s musical fantasy Pennies From Heaven (1978); other appearances include Brazil (1985), Who Framed Roger Rabbit (1988), Hook (1991), Super Mario Bros, (1993), a 1996 episode of Tales From the Crypt, The Lost World (2001), Son of the Mask (2005), Doomsday (2008), A Christmas Carol (2009) and Snow White and the Huntsman (2012). He also reprised the role of Smee from Hook in the 2011 mini-series Neverland. Some sf bloggers like to parade their impressive stats. That’s never been the style at Harlan Ellison’s website. There Rick Wyatt presides as webmaster and for him it’s mainly about, “Whoa! More people are reading this site. How are we going to pay for the hosting plan?” He collects contributions from Ellison’s readers to pay the bills. Yesterday Wyatt wrote that the site now gets 3,000 unique visitors and loads 10,000 pages a day. They exceed 100GB of bandwidth daily. “Small potatoes to the Yahoos and Hulus but extraordinary traffic and growth for an author site,” said Rick. The Amazing Stories trademark has been licensed to FuturesPastEditions Ebooks Publisher for use with a new imprint. Amazing Stories Classic Reprints will publish sf, fantasy and horror works drawn from Amazing Stories and its companion magazines Amazing Stories Quarterly and Amazing Stories Annual. There are immediate plans for two anthology volumes of past Amazing Stories anniversary issues. The new imprint will feature Amazing’s comet tail logo from 1940s and 50s. Works will be published in both electronic and print formats. Two short stories by the late Octavia Butler, discovered among her papers in the Huntington Library, will appear in an e-book titled Unexpected Stories this June. “A Necessary Being” and “Childfinder” will be published by Open Road Integrated Media in a voume with an introduction by Walter Mosley. Butler, who passed away in 2006, was posthumously inducted to the Science Fiction and Fantasy Hall of Fame in 2010. Yes indeed, after seeing this new Godzilla trailer I know what I’ll be doing on May 16. The Andre Norton Award for Young Adult Science Fiction and Fantasy is presented annually by SFWA to the author of an outstanding young adult or middle grade science fiction or fantasy book published in the previous year. The committee will consider submissions of young adult/middle grade prose or graphic works first published in English in 2013.